A hospital chain has found a way of caring for both the young and the old by having them take care of each other – and in the process, built a bridge across generations. 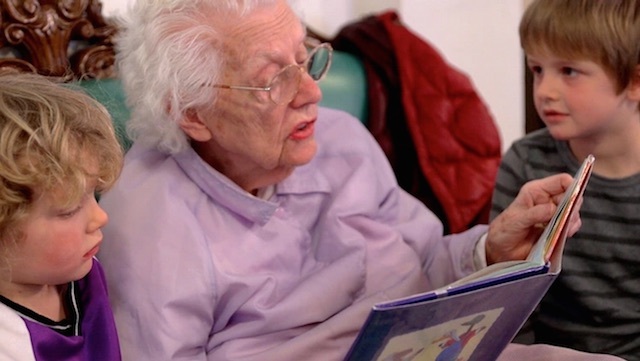 The Intergenerational Learning Center consists of a preschool inside the Mount St. Vincent nursing home in Seattle, Washington. The 400 adults in the assisted-living center join the kids in daily activities from music and dancing to storytelling and just plain visiting. The Center’s managers say the children learn from their elders and are nurtured by the adults while the invigorated seniors get a new sense of purpose and well-being from the playful tots. Filmmaker Evan Briggs launched a Kickstarter page to finish a documentary about the place. My daughter and I have often discussed the idea of combining homes for the elderly, homes for children, and pet rescue organizations. I think the combination could be beneficial for many.